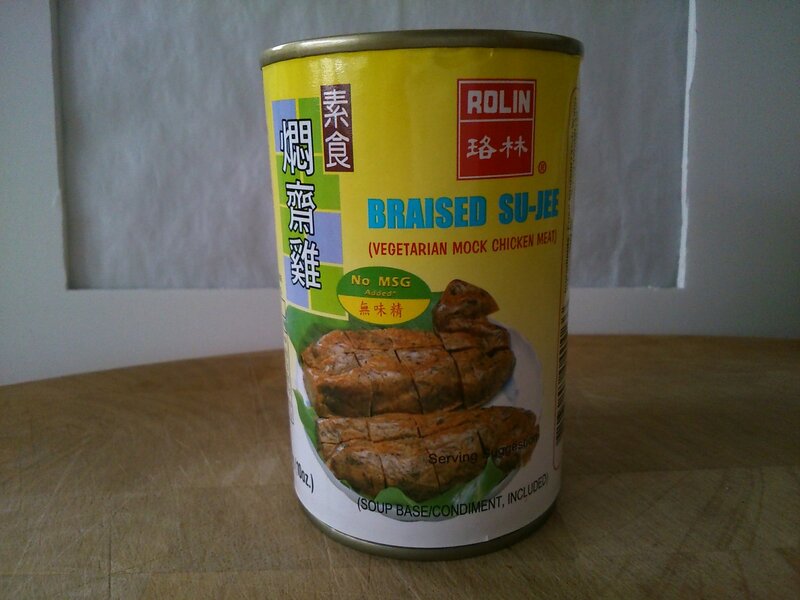 Over the last few months I’ve tried the whole range of Rolin Chinese mock meats that they stock online at Wing Yip supermarket. The mock meats are actually seitan, or as it says on the tins, fried gluten. They have a pleasing slightly chewy texture, and make a nice change from tofu or cashew nuts for a stir fry. Sensibly, I made no notes about what I made with the mock pork, abalone, and duck… But the tin of mock chicken was sat there in the cupboard, looking like a great base for a dish to go with the leftover vegetable fried rice that needs using up today. Happily, I also had choi sum, and I’m still working my way through the celery mountain… so I made this simple, but very tasty stir fry. Heat the oil in a wok over a medium heat. Fry the drained mock chicken for a couple of minutes on each side, until browned. I’ve left the mock chicken in large pieces for the photograph, to show how it is when it comes out of the tin. I cut it into smaller chunks for the finished dish. Remove from the wok and set aside. 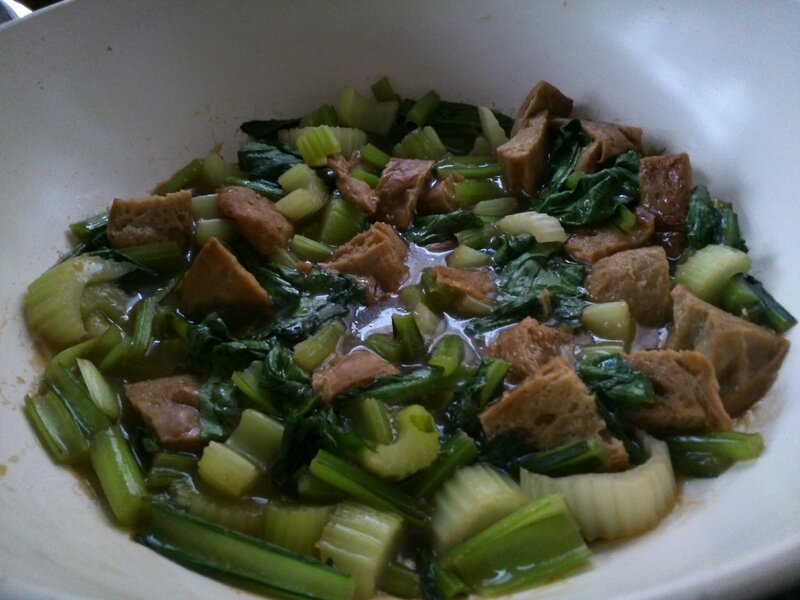 Add the choi sum stalks and celery to the pan, and stir fry for 2 minutes. Add the ginger, shaoxing wine, the sauce from the mock chicken tin and the vegetarian oyster sauce to the wok. Give everything a good mix together, and simmer for another 2 minutes. Add the potato starch, stirring as you do so. Return the mock chicken to the wok, along with the choi sum leaves, and bubble everything together for a couple of minutes until the leaves have wilted.